On May 3rd 2017 Indonesia are hosting World Press Freedom Day, in Jakarta. Only last month Indonesia blacklisted 3 journalists trying to get in to West Papua. There are currently numerous websites being shut down for speaking out about West Papua, and citizen journalists are repeatedly intimidated, arrested and tortured for reporting on the regime. Please take action to draw attention to the irony of World Press Freedom Day being held in Indonesia. Click on this link to sign up to our thunderclap. 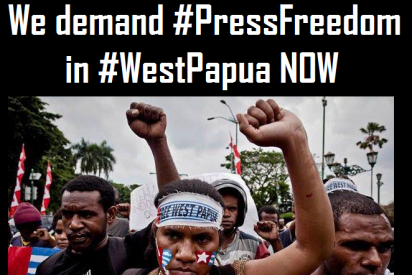 It takes only 2 clicks, and will help West Papua go viral by sending a tweet or post automatically from your account on May 3rd demanding Indonesia allow #Pressfreedom into #WestPapua. It’s really easy. Please also join our Global Days of Action to help shine a light on West Papua between May 1st & May 3rd.